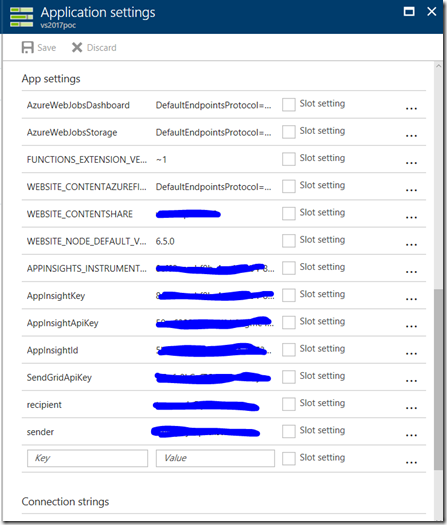 The development tools and processes for Azure Functions are ever changing. We started out only being able to create a function through the portal which I did a series on. We then got a template in VS2015, but it really didn’t work very well. They have since been able to create functions as Web Application libraries and now we are close the the release of a VS2017 template. 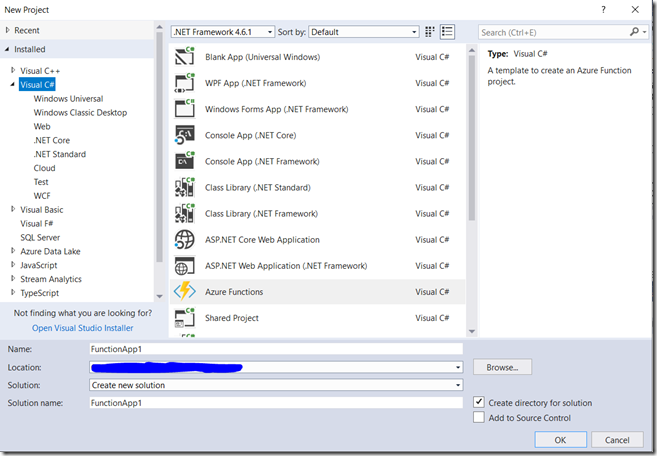 This post will walk through the basics of using the VS2017 Preview with the Visual Studio Tools For Azure Functions which you can download here. To create the initial solution open up the New Project dialog and find the Azure Function project type, name your project and click OK.
To add a function to your project, right-click the project and select New Item. 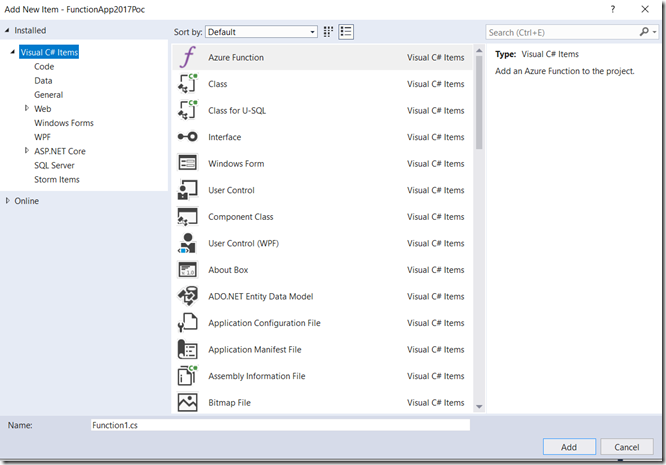 In the New Item dialog select Azure Function and provide a name for the class and click Add. The next dialog which will appear is the New Azure Function dialog. Here you will select the function trigger type and its parameters. In the example below a timer trigger has been selected and a Cron schedule definition is automatically defined to execute every 5 minutes. Also in this dialog you can set the name of the function. When you compile a folder will be created with that name in you bin directory which will be used later for deployment. 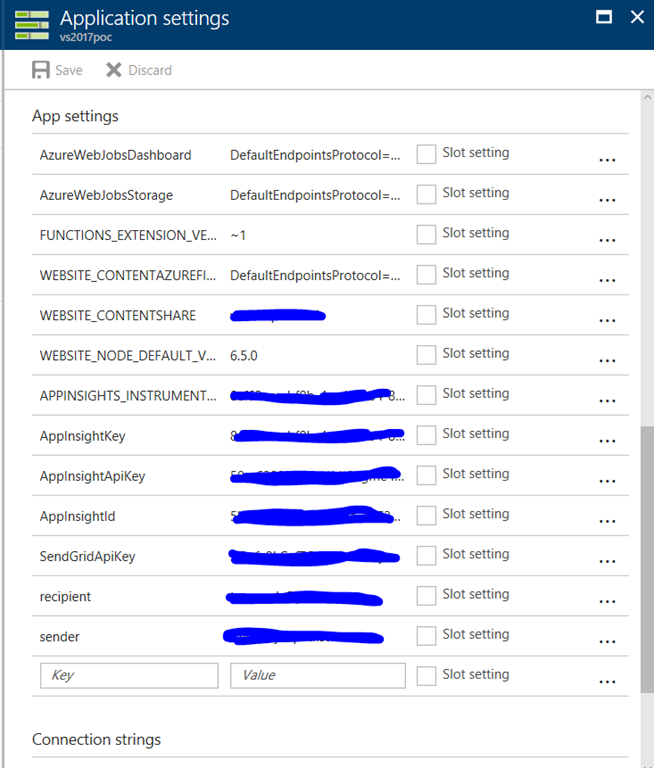 With each generation of Azure Function development the way you initially define bindings changes (even if they stay the same behind the scenes). Initially you had to use the portal Integrate page. This had its advantages. It would visually prompt you for the type of binding and the parameters for that binding. 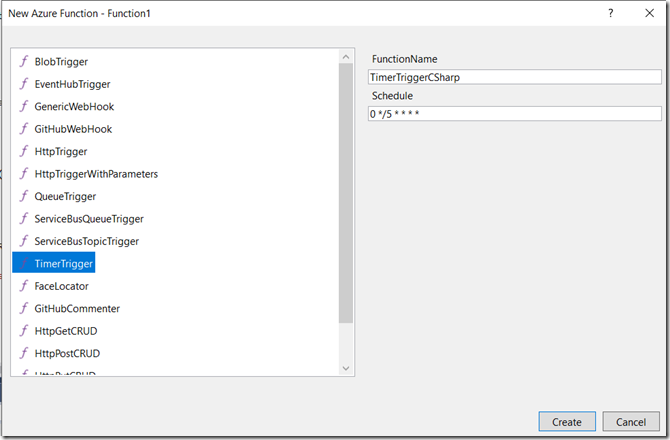 With the Visual Studio template you have to add attributes to the Run method of your function class. This requires that you know what the attribute names are and what parameters are available and their proper values. You can find a list of the main binding attributes here. At compile time the attributes will be used to generate a function.json file with your trigger and bindings definition. If you are building functions in the portal you have to create a projects.json file that defines the packages you want to include. This requires that you know the format of the file. Thankfully with the Visual Studio template you can use the normal Nuget Package manager. There are a couple of ways to deploy your solution. In the end a Function App is a specialized App Service. This means you have the same deployment options of Visual Studio, PowerShell or via VSTS continuous deployment. The main difference is that you don’t have a web.config file and have to manage you app settings and connection strings through the portal. This can be reached by following the Application Settings link under the Configured Features section of the Function App Overview page. While creating Azure Functions still isn’t a WYSIWYG turn key process the latest incarnation gives us an ALM capable solution. I believe this is the development approach that will stabilize for the foreseeable future and anyone who is creating Functions should invest in learning.